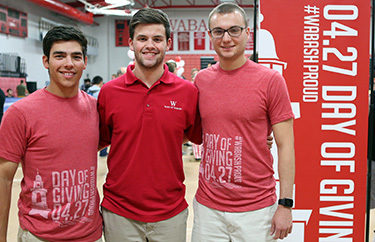 The Wabash community proved to be more than just #WabashProud during the April 27 Day of Giving. Record giving, record dollars, and record participation suggest Wabash is stronger than ever. The big numbers are 3,500 gifts and more than $600,000 raised. But the stories unfold with a deeper dive into the day’s statistics. 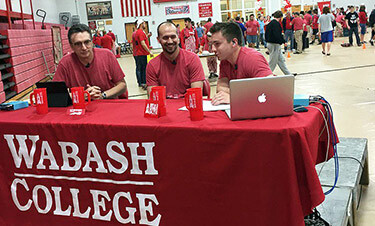 One of the big trends was the strength of participation by younger Wabash men. Students currently enrolled made a huge impact with 590 students making 815 gifts. Even more interesting is that the freshmen and sophomores led the way. Of the four classes on campus, the Class of 2019 had 171 students make a gift just edging the Class of 2018 with 160 donors. The popular affinity challenges had a big role in raising big bucks. The top affinity challenges were football, FIJI, Phi Delta Theta, Delta Tau Delta, Class of 2016, Basketball, Kappa Sig, and Glee Club. Andrews said dollar figures from each of the nearly 70 affinity challenges were still being calculated. The College Advancement team was particularly pleased to see how the number of donors increased by gift level. Donors giving $1,000-$4,999, $500-$999, and every category of gifts less than $500 have all increased since the inception of the Wabash Day of Giving three years ago. The 18 lead-challenge donors contributed more than $210,000 to the day’s fundraising. Current students led first-time donors with 254 new participants. “Friends” of the College made 95 first-ever gifts to Wabash. Current parents chipped in with 49 gifts while 11 staff and three faculty were first-time givers. Knowing that Wabash men like to compete, Andrews pointed to similar days of giving and the dollar impact per student. Butler, Earlham, Valparaiso, Indiana, Purdue, and Notre Dame, all had days of giving this year. Wabash donors far surpassed all of those schools in participation and dollars per students. Wabash had 26 percent of its alumni base make a gift. The next highest was 17 percent at Notre Dame. Wabash’s Day of Giving effort generated $714 per student compared to Purdue’s $584 per enrolled student.